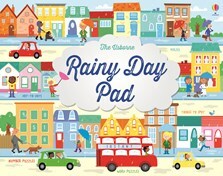 Keep children amused whatever the weather with this irresistible activity pad with 30 tear-off sheets of puzzles, mazes and doodle ideas. Children will love finding the route through an underground maze, colouring owls as they perch in the trees and more. Ideal for travelling and quiet times, this pad can also be shared between groups at parties.